Why Use a Bath and Shower Filter? Chlorine in tap water is a health risk. With few exceptions, most U.S. municipal water treatment systems use chlorine in tap water for disinfection purposes. Chlorine is a chemical that is effective at killing different types of biological organisms in groundwater, such as harmful bacteria and viruses. Exposure to chlorine in tap water is not considered harmful by the water treatment authorities. However, it is still a toxic chemical, and scientific studies have clearly shown that ongoing daily exposure to chlorinated water, both by drinking it and also by bathing and showering in it, is detrimental to health. This article is focused primarily on the health risks associated with bathing and showering in unfiltered chlorinated water. What scientists and studies have revealed is that the real problem is not so much with the chlorine itself, but its disinfection by-products (called DBPs). For example, when chlorine is added to water, it creates Trihalomethanes (THMs), such as chloroform. Chloroform, and other THMs, increase the number of free radicals in the body, which can cause cellular damage and are considered highly carcinogenic. According to Dr. Peter Isacson, M.D., Professor of Epidemiology at University of Iowa College of Medicine, "Almost two decades have passed since known or suspected human carcinogens were first found in municipal water supplies. One of them, chloroform, produced by the chlorination process, exposes millions of Americans. The potential for a major public health problem is unquestionably there, and yet, progress has been slow." In fact, chlorine by-products are associated with various cancers, especially breast, bladder and colon; disorders of the nervous system and immune system; as well as dysfunction of the kidneys and liver, just to name a few. I have found that many people understand that drinking chlorine in tap water is unhealthy and have invested in drinking water systems that filter out the chlorine and its by-products or they drink bottled water (which is not a viable solution since up to 40 percent of bottled water is unprocessed tap water). In addition, bottled water companies have to use some form of disinfection—and chlorine is the cheapest. However, what most people don’t understand is that over half of our daily exposure to chlorine in tap water is from bathing and showering. So drinking filtered tap water is only half the solution. Even though I had filtered my drinking water for chlorine and other contaminants for many years, it took me a while longer to realize how much chlorine I was being exposed to in an unfiltered shower. We just don’t think about it. During a shower, and to a lesser degree during a bath, chloroform and other toxic substances in tap water evaporate into the air and are inhaled in high concentration. The inhalation of chlorine and other chemical vapors into our lungs means that these chemicals enter directly into our bloodstream. Conditions that are aggravated by chlorine exposure during bathing and showering are most respiratory conditions, especially asthma, COPD, bronchitis, as well as sinusitis, and other conditions related to the nose and throat. In addition, since most of us bathe and shower in warm or hot water, our pores are wide open and our skin readily absorbs the chemicals. And then there is the cosmetic effect of chlorine—it strips the protective oils from the skin and hair, causing excess drying and wrinkling of skin, itching and rashes, as well as dry and brittle hair. Fortunately, the solution for reducing exposure to chlorine and its by-products while bathing and showering is fairly simple and relatively inexpensive. Our recommended bath water filters range in price from about $30 to $60, and the filters last from 6 to 18 months, depending on your usage. The shower filters range in price from $30 to $85 and the filters last about 6 months. Your skin will get much more saturation of the chlorine in water during a bath vs a shower. However, during a shower, you will inhale more of the chlorine by-products. Thus, if you need to choose between one or the other, I would go with whichever you take more often—showers or baths. If your bath and shower use is equal, then I would opt for the shower filter because I believe the high concentration of chemicals inhaled while taking a hot shower has greater health risks. If you like the convenience of having chlorine-free water at all the faucets in your home, you might want to invest in a whole house water filter system. 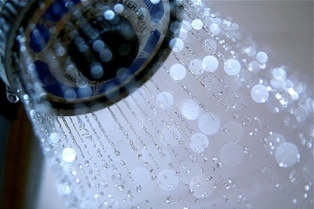 ESDwater.com; Showering in Tap Water – Should You Bathe in Bleach? Return from Chlorine in Tap Water to What Is In Tap Water?